This is a very clever idea. I have two offices one at home and one at work, both desk just like ever office they both have a scotch tape dispenser and an extra USB hub. Now Earth-Trek has combined the two into one very useful and space saving product the USB Scotch Tape Dispenser. Provantage has the HP (Hewlett-Packard) DeskJet 6940 Inkjet Printer for the Bottom Low Price of $99.36 includes shipping. HP's affordable performance print solution for professional printing at home and office. Work the way you want to with wired Ethernet printing and print sharing with up to five computers. Work more productively with breakthrough speeds up to 36 ppm black, up to 27 ppm color in Fast Draft mode. Print professional-quality color up to 4800 optimized dpi or optional 6-ink color. Convenient, direct photo printing without a PC from PictBridge-enabled cameras using printer's front USB port. Create standard and custom size photos up to 8.5 x 24 in, with or without borders. Save time and use up to 50% less paper with standard auto two-sided printing. Automatic paper type sensor and standard 250-sheet plain paper tray are other convenient paper handling features. Enhance and fix photos automatically with HP Photosmart Premier software. 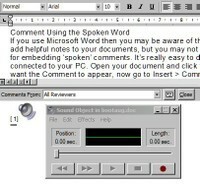 If you use Microsoft Word then you may be aware of the Comment facility that lets you add helpful notes to your documents, but you may not have spotted a little extra facility Propellerhead has unearthed for embedding ‘spoken’ comments. It’s really easy to do and all you need is a microphone connected to your PC. Open your document and click the mouse on the spot where you want the Comment to appear, now go to Insert > Comment and on the split frame toolbar that appears beneath your document, click the tape cassette icon. (In later versions of Word go to Insert > Comment and select Voice Comment from the drop-down menu). This opens the Windows Sound Recorder utility, click the Record button, say your piece and press Stop. Looking for a easy way to shred that junk mail especially those unwanted bank cards that comes every other day. 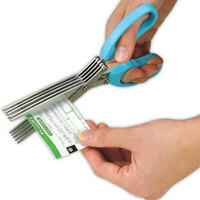 The Shredding Scissors works five times faster then that pair of scissors you've been using. The only problem I see is that it would also take five times the strength to cut those damn bank cards. Available from Japan for 2,010 Yen or $17 USD. Product page via gizmodo. What time is it? It's time I learn how to read my damn clock! 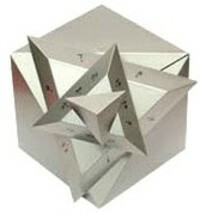 The Time Cube desk-clock slowly rotates through a variety of angular, geometric forms like a Clive Barker puzzle-box, snapping into cube-shape at noon and midnight. It does display Hour, Minute and Second. 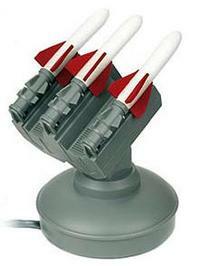 Just connect your missile launcher to your PC or laptop via USB – so no batteries needed. We truly believe this is WHY the USB was invented in the first place! Load the software (Windows 2000 and XP compatible) and acquire your unsuspecting target! The launcher pans 180 degrees and tilts up to 45 degrees. A simple move of the mouse will aim your harmless soft foam projectile...and with a click it’s bombs away, complete with cool sound effects! Cost 59.95 USD. A totally new meaning to firing someone! 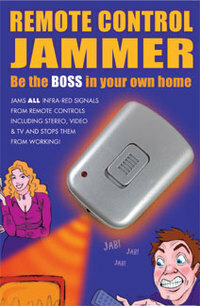 This remote control jammer is just what you need to stop people changing the channel you want to watch. In fact, this contraption works by blocking all infra-red signal in its radius and so will work with stereo, video and TV remotes! This is a great toy to take at your next office meeting to screw with the power point presentation. Coming soon, office privacy without walls: Babble. Remember the old TV show Get Smart? They would use the old Cone Of Silence when they didn't want to be heard. Well, Babble is a modern day version. Babble is the industry's first sound management system designed to provide patented voice privacy without walls™. Connected to the telephone, Babble rearranges the phonemes of your voice and surrounds your work space with a scrambled version of your recorded voice. 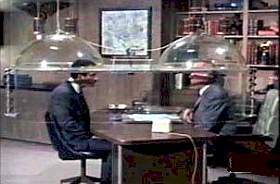 Babble's use of indecipherable natural "human sound" achieves confidentiality without distracting you or the people around you.